Armistice Day – Fix Bayonets! Yes, I agree with this. It was Armistice Day, and didn’t need to be changed. Take a look at the t.v. and we see 24 hours of war movies on Armistice/Veteran’s Day, Labor Day, Memorial Day…why sell a product that creates more veterans on the t.v.? Shouldn’t we be trying to stop wars so we can remember the fallen and celebrate not adding to the number? 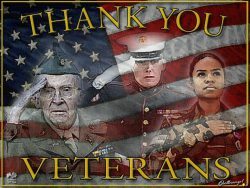 And yes, thanking them for their service…but the message is so mixed up. What are they actually trying to “memorialize” anymore? There are times when it becomes necessary to send its young men and women into the crucible of combat in defense of our country. The problem is never about those who serve; the problem is with pea-brained politicians who send our troops in harm’s way when there are other options. I have yet to hear anyone “in power” tell me what our national interests were/are in either Afghanistan or Iraq. I have met with the families of Marines who were killed while serving on active duty. It is the hardest task ever assigned to me; you never forget the heartbreak that shows so clearly on their faces. These fallen heroes do deserve our remembrance; erecting memorials is the least we can do, as a nation, to symbolize our gratitude. I could go on-and-on but I won’t bore you further. Hollywood does nothing to add to the conversation. Some may find the visuals entertaining, but these films more recently are made by people who never served. I never met anyone seriously wounded who was back on his feet within 30 minutes of being hit. More to the point, there is nothing romantic about war. The battlefield carries with it a stench that no one ever forgets —and you don’t get that exposure while sitting in the theater or in front of your television. Your point is a good one, because if the movie-goers knew the truth of it, they would not watch such things while munching on popcorn. I do think that we should honor our fellow citizens who stepped up to the plate, donned the uniform of their country, and who served honorably. We can continue to call it Veteran’s Day. I simply believe that Armistice Day should be reserved for those who sacrificed so much in World War I. As I alluded in my post, the British continue to do this; their annual Remembrance Day ceremony. It is a remarkably emotional event. In the US, Memorial Day was intended to remember those who died while serving in the military services; it has morphed into a day when everyone goes on a picnic without giving one moment of the day to reflect on those sacrifices. We should be ashamed. Yes, that last point is what bugs me the most. it’s so bad that I get the reasons we’re having these holidays mixed up. I mean, that’s what happens now with a “military-related” federal holiday–break out the beer and barbecue pit, take advantage of sales, and watch a game. I think Pearl Harbor Day is the one exception I’ve seen each year–and that’s only in the morning. By afternoon, it’s a normal day again. I hope you’ll continue reading Fix Bayonets; I additionally post a social-commentary blog titled Thoughts From Afar. Thanks for letting me know. I’m always on the lookout for good info and research. Interesting that I was born at 11 AM then. 🙂 Because it’s all about me ya know. World War One remains in my my mind the most brutal, most violent, most tortorous, most absurd conflict without a cause that has ever occurred upon the Earth. It makes me think All men should tell their governments to GFY unless their mainland is being directly attacked and in this case respond with total annihilation upon the attacking country or force. Weapons are now available to make that happen. In the case of guerrila warfare perpetrated upon a country such as what happens with the moslem vermin driving a rental truck into a crowd of people, kill ever moslem in your country who reamains after a 30 day period as a response and disallow entry of anyone who is a moslem or fill in the blank, but it’s going to be a moslem who fits the profile these days because of their worldwide conquest koran bluprint. Few people today even realize that there are those who are at war with us. Fewer people realize what it takes to defeat an enemy. It isn’t something for the powder-puff or gender-confused. The costs of war far exceed the material losses. Men and women die, they receive grievous wounds and injuries. Some of these injuries are psychological; no one ever “gets beyond it.” And then we have the suffering of their families … and it is a suffering that lasts for the rest of their lives. I’m no pacifist; I only think that if we are going to be involved in war, such a decision must rest upon a clear understanding among all of our people about what our national interests are. Once the war is on, politicians should stand back and let us win it. It should never drag on-and-on. We are still dealing with the Korean War today because Truman wanted a truce before the war was won. Let us defeat the enemy, and when rendered, the defeat should be so overpowering, so complete, that no sane person would ever want to challenge us again. Annihilation of the enemy is how we preserve the lives of future generations. Politician have never figured this out. World War I was far more complex than that. It may have had as its roots the Congress of Vienna (1814). Here’s a video that you may find interesting. I will only add that without the introduction of US forces in 1917, the people of France would be speaking German today. I don’t believe any politician, even with the best intentions, could focus on individuals when it comes to war plans. At this point, [I think] I’d much rather be in combat with the ability to fight back than be a family member at home with only the ability to send cookies and baby wipes to my loved one(s) in combat. Thanks for the WWI video. I haven’t seen anything yet very comprehensive about the event and look forward to watching it. Just watched though the vid Mustang. Trench warfare and millions of men killed versus millions of men and their families enjoying life. Un Real. Questions remain – Why WWI? I still don’t know. America’s involvement in WWII ? The failed economic policies of FDR. All massive death and destruction is the result of dumbasses in positions too high for their skill set. @ Kid … Why World War I? There is no better illustration of the complexity of World War I than to look at the nobility of the time. We must begin with Queen Victoria of the United Kingdom. She had nine children. Her grandchildren included German Emperor Wilhelm II, Queen Sophia of Greece, King George V of the UK, Queen Maud of Norway, Empress Alexandra of Russia, Queen Marie of Romania, and Queen Victoria Eugenie of Spain. In the aftermath of the Napoleonic Wars, the heads of Europe convened the Congress of Vienna (Nov 1814 to June 1815). The purpose of this meeting was to provide a plan for peace in Europe by settling issues arising from the Napoleonic Wars and the French Revolution. The goal was not so much to restore old boundaries seized by Napoleon, but to resize the man powers in order to achieve balance of power. The Ambassadors, led by Klemens von Metternich, were all conservative, in the sense of that term in 1814—which means pro-Nobility, and all of the detested the notion of republicanism. The French Revolution (liberalism) threatened the stability of the whole of Europe. At the conclusion of the congress, France had lost all of its recent conquests; Prussia, Austria, and Russia made significant gains in territory. Prussia added smaller German states in the West, including Swedish Pomerania and nearly two-thirds of Saxony. Austria gained Venice and much of Northern Italy. Russia gained parts of Poland. The Netherlands established a new kingdom, including some former Austrian territory that in 1830 became Belgium. Thinking to maintain this balance of power, the noble heads of Europe began to form alliances —insurance, if you will, against the aggression of other nations. Think of the UN and NATO today where each member nation pledges to help defend other member nations in case of acts of aggression. There were three: The Triple Entente, The Triple Alliance, and the Balkan Alliance. What made these alliances dangerous is the secret alliances that were made in the background. The breakdown of these was as follows: Russia, France, and Great Britain formed the Triple Entente. Unknown to either Britain or France, Russia also made an alliance with Serbia. The Triple Alliance involved Italy, Austria-Hungary, and Germany. Unknown to Italy or Germany, Austria-Hungary made an alliance with Bulgaria, and unknown to either Italy or Austria-Hungary, Germany had made a secret alliance with Bulgaria and the Ottoman Empire. Again, recall the grandchildren of Queen Victoria. Note 1: By the time World War I had broken out, Austria had become the Austro-Hungarian Empire (there was never any cultural tie between Austria and Hungary—it was a very odd arrangement). Note 2: Recall that the heads of Europe had an aversion to liberal republicanism. In July 1914, the Archduke (heir to the throne) of the Austrian-Hungarian Empire was assassinated by Serbian nationalists. It was an act of war and Serbia became the target of Austria-Hungary. But Russia had an alliance with Serbia, which gave the Serbs a false sense of security. Now we add Russia into the mix. Germany supported Austria-Hungary; Germany’s involvement also obligated the Ottoman Turks to support the German cause. When Germany, Austria-Hungary, and Russia begin military mobilization for war, Great Britain entered the fray, declaring war on Germany on 4 August 1914. Great Britain’s involvement also engaged Canada and Australia. It was the beginning of World War I. The British Navy established a naval blockade of Germany; Germany reciprocated by ordering its U-boats to sink British flagged ships bring foods and other things into the United Kingdom. The United States wanted to stay out of this war, and I think would have were it not for the fact that German U-boats sank RMS Lusitania with 128 Americans on board on 7 May 1915; evidence today suggests that Lusitania was carrying contraband from the USA to the UK (munitions). President Wilson insisted that Americans were “too proud to fight” in a European war (remember, he was a Democrat), but warned Germany against using U-boats against passenger ships in the future. Wilson was reelected in 1916, but only because he promised to keep the USA out of the war in Europe. Germany resumed its unrestricted submarine warfare—knowing full well that it would trigger American involvement. Germany then invited Mexico to join the Central Powers by attacking the United States. The now-famous Zimmerman Telegram was intercepted by the UK and presented to the US, and Wilson released the note to the press to gain popular support for war. After Germany sank seven US merchant ships, Congress declared war on Germany in April 1917. Note 3: Wilhelm II had been looking for a major war since the Russo-Japanese War (1904-1905); no doubt the man was three bubbles off plumb. @C-CS. Took a YouGov poll yesterday. Long one centering on what America should do to help around the world. I said stop all US aid on relative questions. They asked me 30 times in 30 different ways and each time I said turn off the spigot. Otherwise many other questions regards our involvement with other countries, I said turn it all off. No doubt the lefties want us (USA) flying all over the world helping the poor people etc, etc, etc, of course with we taxpayers paying for it and getting nothing in return. Reminds me (talkative ain’t I 🙂 of sitting in an open air restaurant near an intersection, and a truck got center-punched and turned on its side. Here is some chick 4-5 tables away wiht her husband /boyfriend in their early 30’s. She starts yelling out “Someone needs to go out there and help!” Then, “Hey the truck is leaking gas! Someone needs to get out there!” All the while sitting back in her chair like she’s in a lazy-boy and hubby/boyfriend not exactly jumping up. There”s your typical lefties. Here’s the thing … white liberals feel bad about living in the greatest country on earth, so what they are proposing is that we all agree to give all of our wealth and resources away to people who are so stupid, they don’t even know how to grow potatoes. I think they call it “global redistribution” of someone else’s money. This feeds right in to the George Soros Open Society Foundation. Of course, the fellow who is raking in all kind of money from globalist enterprises is … um … George Soros. So I think you’re right: leftism is a incurable brain disease. I recall my grandmother (1898-1981) insisting that we go back to commemorating the 11th hour of the 11th day of the 11th month instead of having a generic Veterans Day. She told me that November 11 was not a federal holiday, but that all the workers in the Veterans Administration paused on the 11th hour of the 11th day of the 11th month — and the power that such a pause had. I watched the annual Remembrance Day event last night at Royal Albert Hall. It was quite emotional and over-powering. I am reminded of something JFK once said: “A nation reveals itself not only by the men it produces but also by the men it honors, the men it remembers.” We apparently have forgotten our World War I veterans. But not me; I remember them. That video gave me goosebumps and moved me to tears — tough ol’ broad that I am. Previous Previous post: Happy Birthday, Marines!